Ambience Entertainment, Air Pig Productions and Telegael had loads of laughs filming their brand new 26 x 24-minute series, which received production investment from Screen Australia, in association with Create NSW. The series was commissioned by the Seven Network Australia and RTE Ireland. "Seven is delighted to have backed this series as the commissioning broadcaster." The Australian/Irish co-production Drop Dead Weird follows the hilarious antics on an Australian family who move to Ireland to run their family B & B in a remote seaside village. With three 'fish out of water' Aussie kids, one kooky Irish grandfather and two recently zombified parents ... things are going to get weird ... Drop Dead Weird! The three Aussie kids- Lulu, Bruce and Frankie are finding it hard enough fitting into a new hometown but now they have to harbour an enormous secret. Their parents are zombies ... Yes, ZOMBIES. The kids must invent on a daily (even hourly!) basis a way to keep the truth under wraps- or the local Head Mistress and town busybody Bunni Shanahan will be on to them. Their schemes and ideas nearly always result in unexpected outcomes which are a constant source of adventure and hilarity. Drop Dead Weird was created by Sally Browning and Dean Cropp and developed with Ambience Entertainment. 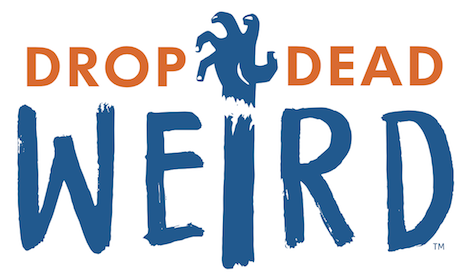 Ambience Entertainment, Air Pig Productions and Telegael are excited to announce that Drop Dead Weird launched on RTÉ2 on Monday the 25th of September. The series will launch on the Seven Network in October. We are excited to introduce our dynamic young cast members along with some very familiar faces starring in this new innovative kids show! Lulu Champ is a 15-year-old born leader. She is the organiser in the family and once (before being relocated) a keen barrel-riding grommet surfer, but her true calling is to be the responsible one. 12-year-old Bruce Champ is destined for fame and fortune, spending most of his time filming clips for his BruceTube Channel and is seemingly a Grandad mini-me with his optimistic entrepreneurial spirit. 9-year-old Frankie Champ is the youngest of the family and is just an ordinary little girl except she also happens to have a brain the size of a planet and has personally taken on the challenge to find a cure for her zombified parents. For former corporate high-flyer, Maggie Champ, thought moving her family to Ireland would be a relaxing sea-change. The changes were not quite as expected- she's now a Zombie! Zombie Mum is played by the renowned actor Amanda Bishop, who appeared in television programs such as: Law and Order, The Story of Us, Maximum Choppage, Wednesday Night Fever. Her most notable role was in the award winning mockumentary, At Home With Julia in which she co-wrote, assistant produced and starred as Former Prime Minister, Julia Gillard. Wanting to reconnect and introduce his family to his Irish heritage, laid-back dad, Fergus Champ finds he is reconnecting in an unexpected way. In fact, he is finding it difficult to stay connected to his limbs at all... now he is a Zombie! Fergus is played by David Collins who is better known to audiences as one half of the Umbilical Brothers. David enjoys both dramatic and comedic roles, most recently being cast in Maya the Bee, working on Happy Feet 2 and appearing in Australian films, Thunderstruck and You Can't Stop the Murders. Bernadette Shanahan- better known as Bunni and a former sweetheart of Fergus - is the secondary school principal, a local councillor, committee member, minor celebrity, busybody and general town trouble-maker. Constantly trying to win "Chunky's" (Fergus') affections and steal him away from the "wallaby woman" she is eternally suspicious of the goings-on at the B&B. Pauline is also a successful writer having written 8 best selling novels in 2012 published her first novel for young people, Jenny Q Stitched Up. Highly experienced comedic actor Maeliosa Stafford, tackles this fun role. With an array of credits in both Australia and Ireland on stage and screen, he was most recently see in the Australian series 'Rake'. Dermot, is the sweet ever faithful friend of the Champ kids, particularly Lulu... who he may or may not have a crush on. Mr and Mrs Champ are the ideal parents- chilled, never tell him what to do and great listeners, offering comforting groaning support.. unlike his mother, Bunni Shanahan. It never strikes him as odd that they never actually speak, he really doesn't twig they are zombies! David Rawle, one of Ireland's most recognisable up-and-coming young talents stars as Dermot. Best known for his role in the popular TV series Moone Boy, his other credits include Song of the sea, Property of the State, and Time again. Local Tubbershandy girl, Aisling who has taken a shine to Lulu and loves everything that is Summer Bay. She's often found around town shivering in summer dresses and insists on hanging out at the beach come rain, hail, or shine...and in Tubbershandy it's mostly rain! Lucy Maher is a talented music lover who has performed in numerous productions in theatres all over Leinster. Most recently she performed in a 1916 play 'Whom We Deliver'. With special guest appearances by Tina Bursill, Ada Nicodemou, Shane Worthington, Anne Tenney, Jonathan Biggins, Paul Livingston and The Umbilical Brothers' Shane Dundas.